Slowly losing her mind, Faye must find a cure to her mental illness. Directed by Chad Allen Barton, this is a story loosely based off of his sister, who took her own life in 2013. 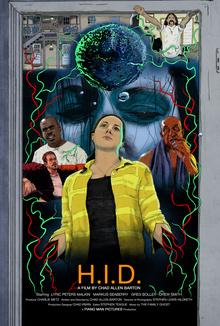 Poster, Digital Copy of H.I.D. & Commentary Version of H.I.D. Includes 2 videos: from H.I.D. Includes Commentary for all the movies and a storyboard comparison video for Avarice. Includes 7 videos: from Faceless, but Remembered, Piano Man Pictures Roadshow, Avarice & H.I.D.